4th grade. 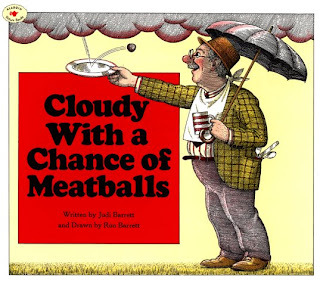 Many thanks to my teacher, Mrs. Johnson, for always reading fun books! This may have been where my obsession began! The inside of the restraurant is um.... quite bright! Yellow makes one happy! At least it keeps you awake! Ha ha. Anyhow, chips and salsa were brought to the table. Hands down, best salsa in the County. No joke. 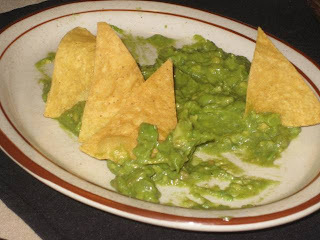 My mom always orders a side of guacamole, she and I both agreed it too was the best you could get in a 15 mile radius. Way to start off right La Poblinita! My entree was up first - I ordered the Enchilada de Mole. 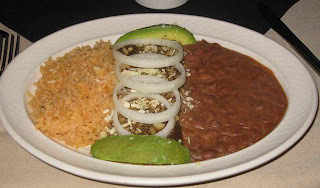 A corn tortilla prepared in a spicy mole sauce sprinkled with queso anejo (an aged, salty, crumbly cheese) and onions. This dish normally comes with two enchiladas but I requested only one to come out on my plate. It was very, very good! I have been on a mole kick and this one cured my craving! 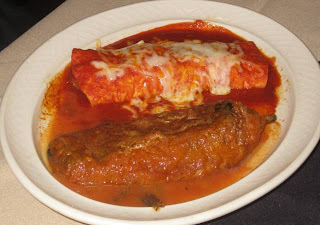 Next was my mom's order, a Chile Relleno and a Shredded Beef Enchilada. The Chile Relleno was a savory mild, fresh chile poblano, stuffed with Monterey Jack cheese and delicatly cooked in a whipped egg batter. This too was the best Chile Relleno in comparision to the competition in the SBC. The egg batter is not thick, it coats the chile perfectly. Excellent. The Shredded Beef Enchilada was not the stand out, I did not care for the thin, tomato enchilada sauce. No big deal, just not their bag. Could the Enchiladas Verde be worth trying? I think so! 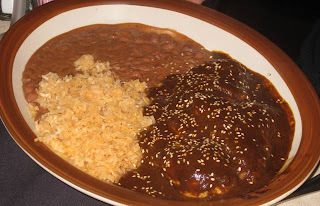 And last but not least was the Mole Poblano. The rich, spicy sauce is served over a breast of chicken and sprinkled with seasame seeds. This dish was just as good as my enchilada! Corn tortillas are brought out to clean up the plate! 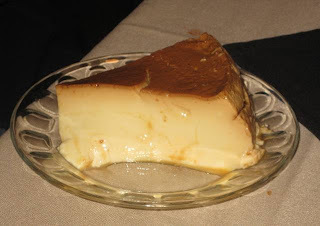 And we had to continue to do one last form of investigative work.. the Flan Test! And, yes that passed with flying colors! The flan did not drip with the carmel sauce making it too sickeningly sweet. The flan was more custard like and I really enjoyed that. All in all, I think La Poblanita is looking really good right now. 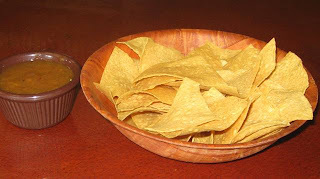 The best chips and salsa, guacamole, mole, and flan. That is all coming from a girl who has eaten out at Mexican food her whole life! I live in one competitive Mexican food town. 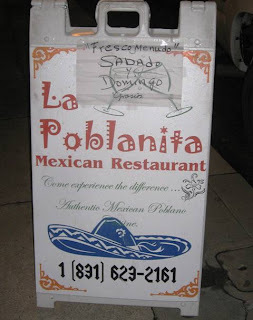 I know what tastes good - and La Poblanita was great! Did I just find a new gem? I think so. Go there for yourself and try it out. Two thumbs up for impressing Melissa Good Taste. 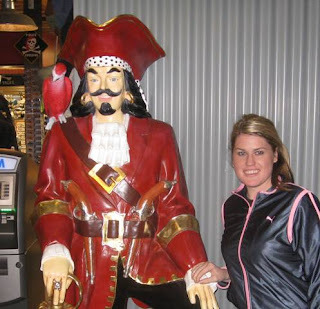 Since going to Maine in October and having Lobster Stew, I have been on a mission for all things seafood! Mostly cream based bisque's to be exact. I have mentioned before that I am a member of Yelp. 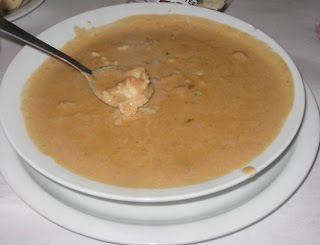 I came across a review for a chowder house located in Pacific Grove and had to go! The rainy weather did not scare me from setting out for a drive to the coast! 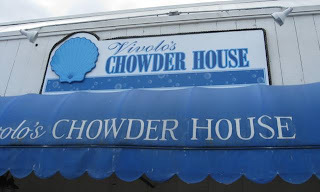 With chowder on my mind I made my way to Pacific Grove. Take the Del Monte exit and follow it all the way down until it turns into Central Avenue, 127 Central in fact. Located on the left side of the road, park on the street and cross over. I was kind of surprised to see I was the first customer of the day, it was 12:00 on a Sunday! Weren't people hungry in Pacific Grove? We grabbed a table for two and began to browse the menu. Water and a soda were ordered and brought to the table. Now for the main event, let's get ready to rumble... 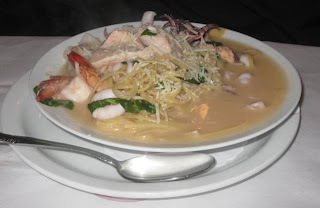 The first entree out of the gate was the Linguini Pescatori House Specialty, with the choice of sauce: Marinara, Alfredo, or Garlic Butter Sauce with fresh fish, prawns, scallops, calamari served on top. We chose the garlic butter sauce and were underwhelmed. The sauce was pretty much salted water with a hint of garlic. The seafood served throughout was of course fantastic! 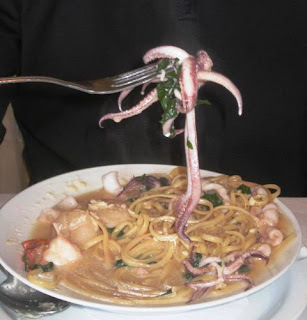 Did you see the size of that squid - woweee!!! Big boy! The linguini was cooked perfectly. My order is up next... 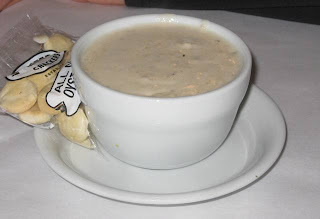 When I read the Special of the Day - Boston Pan Roast Bisque, I had to have it! Prawns, Bay Shrimp, Scallops and Oysters all bathing in a bowl of cream, sherry, and garlic. I loved it! I cleaned my bowl with the Parmesan cheese toast tops that they brought out. What a wonderful treat! I liked this dish very much, it did not compare to Maine - but that is quite a task in it self. All in all, I had a great little meal. It sort of reminded me of a hole in the wall, secret hiding place. They are not really all about the flash, they seem to really stick to the basics. I enjoyed the bisque and wouldn't mind returning to see what other specials they were promoting - they seem to really like to jazz the specials up compared to their simple menu. The prices were kind of high but I don't mind paying the price for seafood, it is so worth it! All in all, I give it 1.5 thumbs up. This past weekend I had not had Mexican food at all. So by, 11:45 am this morning I was craving it in a large way. 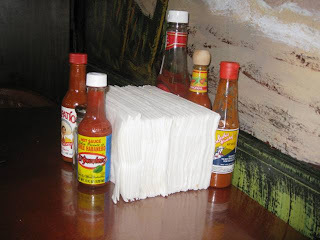 El Michoacán’s has been in the San Juan Road shopping center for easily over 10 years. I have always enjoyed their salsa so I decided to give a go today. My partner in food blogging crime was not at work today so I had to fly solo on this review. 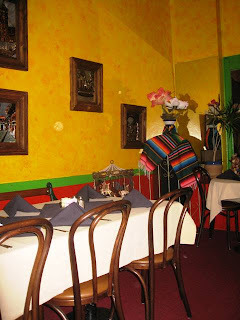 The thing about this restaurant that I just love is the 360 degree of murals they have painted on every wall, ceiling - anything that can be painted! I mean they really try. They have a jukebox that usually is pumping out the hottest jams, today it was quiet - which was nice. 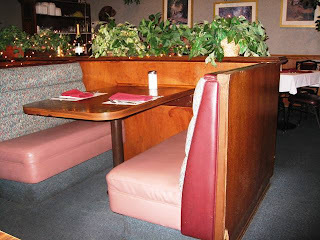 I was seated immediately to a nice table in the corner. A great little spot for the loner girl to take pictures of her food. 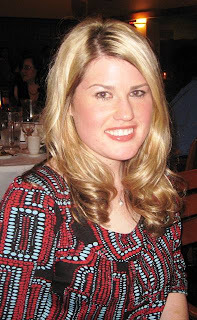 I bet people really thought that I was pretty "special." One of the best bowls of salsa in town. My favorite part of the meal came quickly! Chips and salsa were placed in front of me as I was handed a menu. 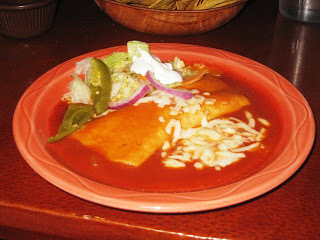 I knew what I wanted so I told the waitress one cheese enchilada ala carte. I made my way through the chip basket happily dunking each chip with their spicy salsa - it has always been so good here. Within 5 minutes my order was up! Now that is service. The enchilada was good. I asked for extra sauce and my wish was granted. The enchilada was made with a corn tortilla which I like. Sometimes the flour tortillas get to be a little doughy underneath the enchilada sauce. I like that they do not use cheddar cheese in the mix. I think it competes with the enchilada sauce so today I was a happy camper. My co-worker Jan swears by this place. In fact, Jan and I need to come back one day to further review the restaurant. Their menu is so large, and is stuffed with an extreme amount of seafood specials. One of which includes abalone - I cannot wait to try that one! Right when I thought you could not go anywhere without your meal being at least $10, I was wrong. Can you believe my meal came out to $3.14. Wow! Quick service, delicious food and it was a bargain! Can't beat that! 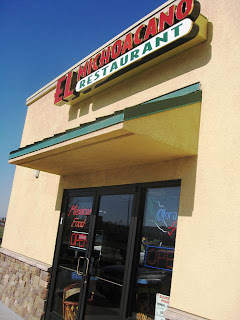 El Michoacán’s has locations in Los Banos, King City, Greenfield and Coalinga. So my Salinas Valley readers can check out this place on their own turf. Tell me how you like it! 2 thumbs up for a welcome change to pricey eats! See that is me, I am alive and kicking! Sorry I haven't posted in awhile but, I had other plans last week. I met up with friends Friday night, Saturday night had to go to the San Benito County Chamber of Commerce Dinner and on Sunday watched football all day. I will resume to my normal blogging schedule, I promise! Happy Eating! 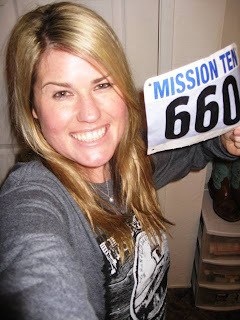 Since my mom got back from Texas I have been trying to catch up with her. She is a busy lady with a lot of things on her agenda so I asked if she wanted to go grab a bite to eat. 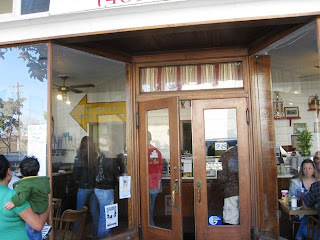 We originally wanted to go to La Poblinita in San Juan Bautista but it was closed, so we drove on in to Gilroy. 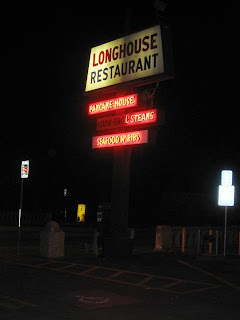 My mom said she had been to the Longhouse before and that it was worth giving it a Melissa Good Taste try. The sign must look familiar to all of the local readers. 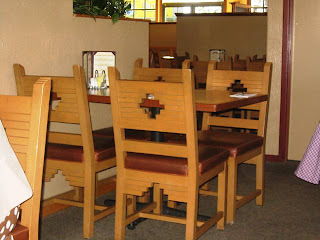 You have driven by this restaurant a million times if you frequent Gilroy often. 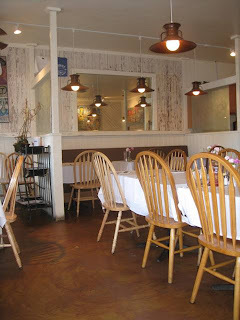 It is located at 8195 Monterey Street and the name describes how the restaurant looks - Longhouse. My initial reaction was that the building was in a time warp. My mom says 60's - 70's, so I trust her opinion. So it is a little dated, that doesn't bother me. A kind server seated us up and took our drink order immediately. A very friendly waitress, by the name of Sandy. came up and took our orders. 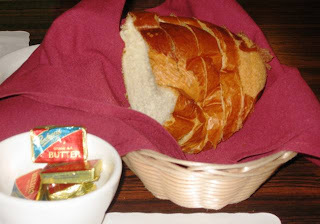 Bread was brought out to us by the hostess and I noticed they heated it up for us. It was scorching hot, I guess that is better than freezing cold right? In no time flat, Sandy came bustling out with my Mom's salad and my soup. The salad was swimming in dressing. 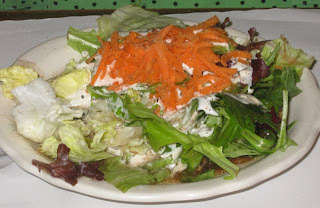 I usually am in favor to more rather than too little dressing on a salad but this was kind of too much more. Ah well. My soup was corn chowder and it was pretty tasty. I didn't want to fill up on soup because they gave me a pretty big bowl. A great soup for bread dunking. Now with our entrees... 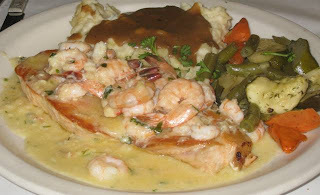 I am first up, I ordered the Fresh Salmon ala Monterey - egg battered, grilled to perfection, topped with prawns, shrimp and crab meat in a creamy garlic white wine sauce. I chose mashed potatoes and gravy for my side. I should have chosen rice but I just really like anything topped with gravy! Here's the thing, I don't know why I thought ordering "fresh" seafood from Gilroy on a Tuesday night was such a smart idea. I thought the dish tasted fine but really, I need to think out my orders a little bit more next time rather than just read the descriptions. 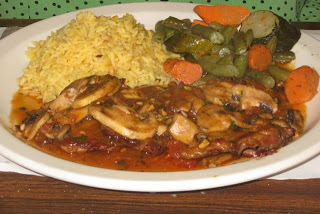 My mom saw a special for Beef Burgundy and ordered that. I think she was sent drooling when she read it was sauteed with garlic mushrooms in a white wine sauce. The meat however was more prepared like a scallopini because the pieces of beef were pounded thin strips of meat rather than a slow roast. Whatever though, she seemed to enjoy mixing the sauce up with the perfectly cooked rice. All in all it was a pleasant experience. 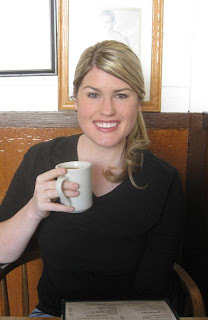 I got to catch up with my mom, be entertained by our high energy waitress and try a new restaurant out to update my blog. It was a good night. I felt for the price of each meal we were served very generous portions. On several Yelp reviews people really seem to like this place for breakfast. The Chicken Fried Steak and gravy probably knock some socks off. I wouldn't mind returning to see how the breakfast plays out. As for now 1.25 thumbs up. FYI - they have a full bar at the end of the restaurant and apparently that is where the Toastmasters meet up! Wahoo! Just got a brand new ride! 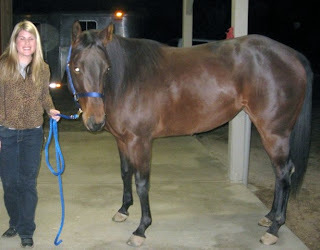 Her name is Miss My Shorty, a 2005 mare - To Short to Play x Missy C Starlight. 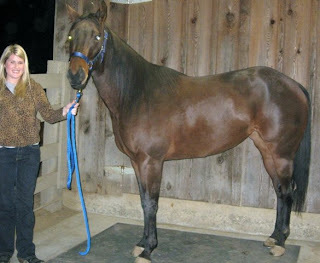 She is cutting horse bred and ready to win! Wish us luck! In the tradition of El Palomar Santa Cruz, Cilantro's has set a new standard in Mexican cuisine by combining authentic recipes with the unique abundance of locally grown produce and freshly caught seafood from the Monterey Bay. The Espinoza family has cooked generation through generation pumping out great food for the masses. 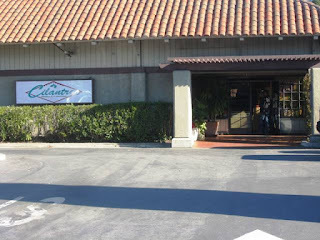 Cilantro's is located at 1934 Main Street in Watsonville, the same shopping center as Nob Hill. My mom had just gotten back from Texas and was craving some good Mexican food. 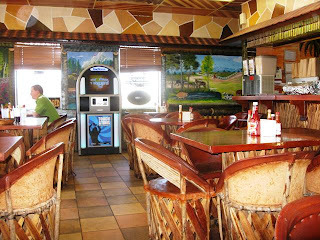 Can you believe there was not a good place to eat Mexican in Milsap or Mineral Wells? 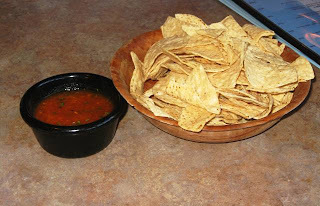 Anyhow, good chips and salsa is what Cilantro's is best known for. 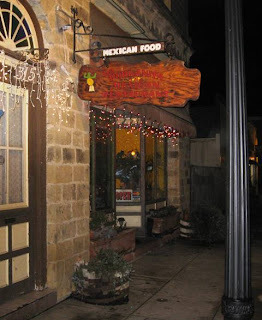 We have been coming here, or their sister restaurant - El Palomar located in Santa Cruz for as long as I can remember. 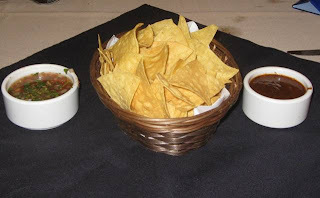 The salsa is great, and the chips are served warm. Excellent. When ever my family comes to Cilantro's we usually get Jose's Special Appetizer to share because it serves at least two people. It is an exquisite combination of charbroiled snapper, skirt steak and sauteed prawns served with handmade corn tortillas and refried beans. It is priced at $15.25 and is such a good deal for the quality and amount of food you receive. Today my mom and I did things a little differently though. I ordered the Chicken Tortilla Soup and was overwhelmed by the amount of food in the bowl. 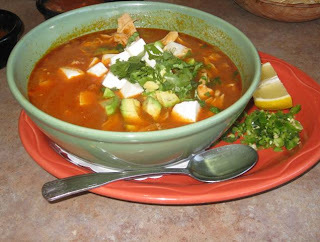 Huge pieces of chicken, generous portions of avocado, cubes of queso fresco and plenty of strips of corn tortillas floated in the spicy broth. I ate and ate and ate but I swear the bowl was never ending. I ended up making a small dent into the soup - too large of a portion for me! My mom ordered the Baby Greens Salad and added Carne Asada to it. 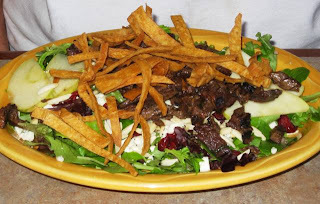 The salad was a fresh baby green spring mix with almonds, gorgonzola cheese and crisp apples tossed in a citrus vinaigrette then topped with chipotle chips. She requested blue cheese to be on the side. 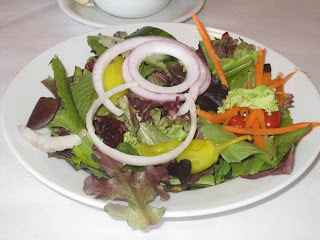 The salad looked beautiful. And she seemed to really enjoy it. The meal was not the best I have ever had there but I blame myself for ordering something new. I wanted to try some thing new and it ended up a bad idea. I just really enjoy Jose's Special Appetizer. I was shocked to see on the bill that my Mom's salad was $15.25 and the side of blue cheese was 75 cents. For the same price you could get the Special Appetizer, which serves huge amounts of carne asada and two types of seafood. The pricing was inconsistent. However, I will return for the chips and salsa alone. Oh and maybe for a Margarita as well. 1.5 thumbs up. Breakfast. It seems like I have been on a quest to find the best breakfast here lately. I am a simple girl, I like cream in my coffee and my bacon crispy. It shouldn't be too difficult should it? 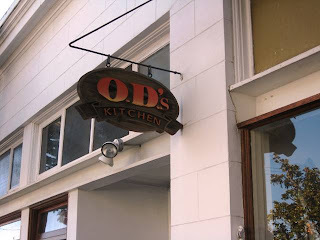 Well, I have heard that OD's Kitchen located off Monterey Street in Downtown Gilroy is the place to go. I tried to go to OD's a few months ago but ended up in Morgan Hill, I was a little off course wasn't I? So I decide to ride my horse and get my chores done early to miss the church crowd that tends to clog up restaurants up at around noon. So we walk up to the side street restaurant and see people waiting outside. This was a good sign to me. 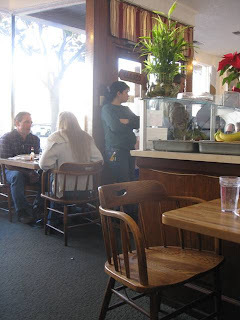 People would not be waiting around on a Sunday morning if the food was not good. You walk in the tiny space and put your name up on the white board and wait for your table. The time seems to fly by quickly and we are seated in the front room in a quiet corner. This spot comes as relief from the hustle and bustle of people walking in and out of the restaurant, we got a good spot. The coffee cups came quickly and were filled to the brim. My coffee was luke warm and could have been served a touch warmer, but I do add two creamers so that probably doesn't help the temperature at all. The waitress came quickly and took our order. 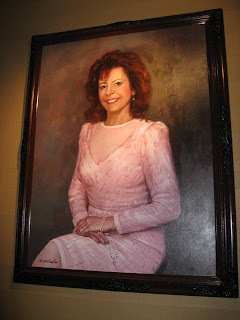 She was a friendly lady who was an old professional, you could tell this was not her first rodeo. 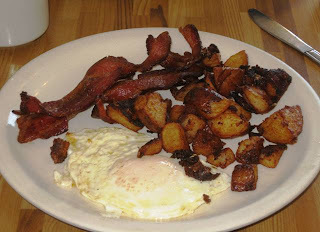 I ordered my usual, one egg over medium, extra crispy bacon and extra crispy home fries. And, can you believe it came EXACTLY to order. This has been hands down the best breakfast I have had for ages. The home fries were out of this world delicious. 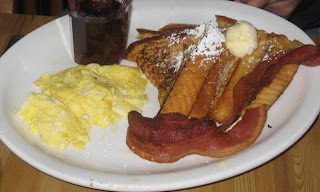 Next up was the French Toast, eggs scrambled and extra crispy bacon. Perfecto! I really am disappointed I have not visited this place sooner! I have heard friends rave about it for years but it just went in one ear and out the other. They serve breakfast only from 8-1 on weekends probably because of the massive crowds that have to feed. They have a really good thing going there. For our meal I was shocked to see it was only $16.80 that is a bargain! I would return to OD's in a heart beat. Two thumbs up for good, cheap eats. One weekend morning, about a month ago, I was lazily lying in bed watching public access television. I know, that sounds lame but I got engrossed in a television show called, "Coastal Cuisine" featuring Tene Shake. I am familiar with the Shake family through a friend of mine who bought cattle for Tene's father, Shabu Shake, past owner of the Old Fisherman's Grotto. I loved the show, and developed a craving for seafood. 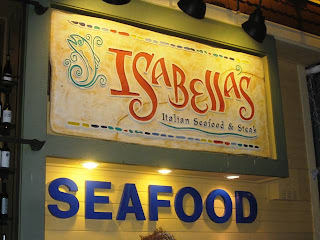 Fast forward a month and here I am planning a trip to Isabella's Italian Seafood, one of Tene Shake's signature restaurants. One of the tables upstairs. 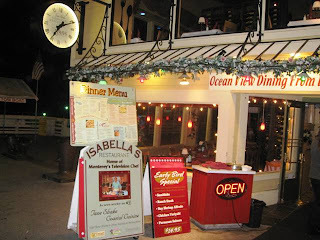 Isabella's is located on Fisherman's Wharf in historic Monterey. Go directly to the Whale Watching dock and you will find yourself standing in front of the two story building. The restaurant offers spectacular harbor views from every table, outdoor dining and a quite atmosphere for fine dining. 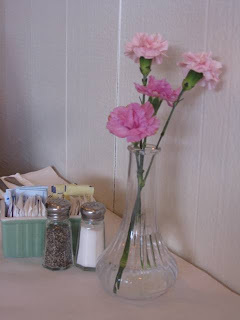 The host brought us to a quaint table upstairs where our meal was about to be enjoyed. 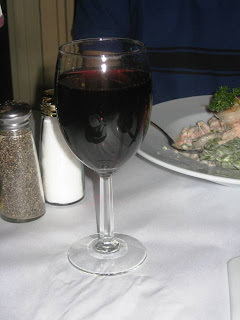 We asked for a house glass of Pinot Noir and it was tasty. I don't normally leave up the wine selection to the house, but today I didn't feel like making a wine selection. 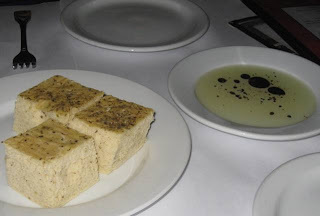 The bread was brought to the table and I was intrigued by its corn bread like texture. It tasted kind of like cake but was not sweet... very interesting. I liked it very much. 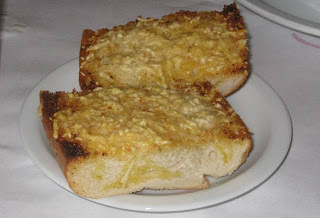 The oil and balsamic dip was a nice compliment to the slices of bread. A complimentary appetizer was brought to our table! That was so sweet of them. 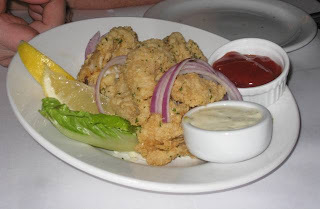 It was a half pound of Monterey Calamari, which they claim is their specialty. It was fried and served with a side of tarter and cocktail sauce. Now on with more food... 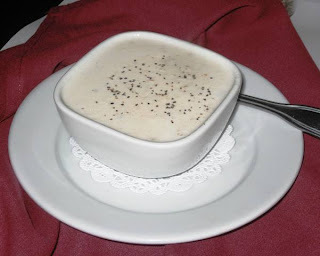 I ordered a small cup of Clam Chowder because I just love the stuff! 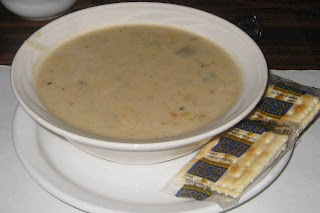 It was funny, earlier this week I had clam chowder from a can, Progresso's, and you just don't know how bad soup is from a can when you have the real thing! It was a small cup, kind of a teaser but it is so rich I was fine with the size. 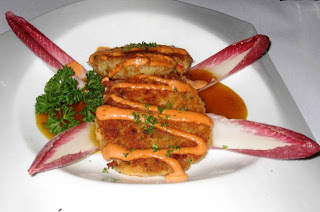 For my entree I ordered... Crab Cakes! Doesn't my plate look beautiful? They didn't have any filler, all crab meat and fried golden brown. Perfect crust! The mango sauce it sat in was delicious - the right amount of tang. Robert ordered the "Best" thing on the menu. The Isabella's Pasta - named after Tene's Italian mother. 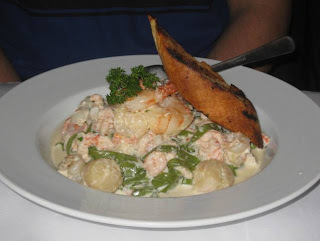 This impressive plate was filled to the brim with lobster meat, crab meat, jumbo scallops and jumbo shrimp sautéed in a Gilroy garlic cream sauce tossed in fresh spinach fettuccini. Wow! That dish is well worth every penny, it was fabulously luxurious - fit for a king! 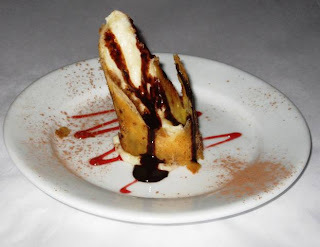 And last but not least, we were both brought a deep fried Cheesecake creation. It was the perfect ending to a perfect meal. I am so happy I made the decision to visit Isabella's Italian Seafood. While at the restaurant I even saw Tene himself wandering about talking to customers and encouraging his staff, exactly what a successful restaurateur should be doing! I wanted to ask him to take a picture with me but, I chickened out. I don't normally talk prices on my reviews but, for this meal the bill came out to $67 and that blew my mind! That is so reasonable for the quality meal we had. 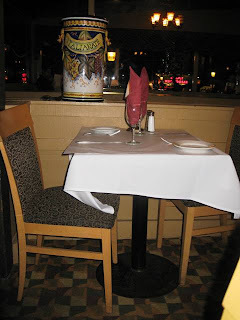 I will return to Isabella's and I cannot wait to try Lattitude’s at Lovers Point, also one of Tene's signature restaurants. I did notice that the wharf was particularly empty, so take advantage of the currently low market price of lobster and cure your seafood craving today! Two thumbs up for sure!